Are Romney’s “Victims” Actually Middle-Class Republican Voters? Romney called for the release of the full video, and on Tuesday afternoon Mother Jones obliged. Audience member: For the last three years, all everybody’s been told is, “Don’t worry, we’ll take care of you.” How are you going to do it, in two months before the elections, to convince everybody you’ve got to take care of yourself? Romney says that the 47% “will vote for the president no matter what.” To evaluate this statement, it’s important to note that since these individuals are not paying federal income taxes, many would fall into a low-income tax bracket. The Pew Research Center conducted a poll in July 2012 indicating 42% of those making between $30,000 and $50,000 per year would vote for Romney. 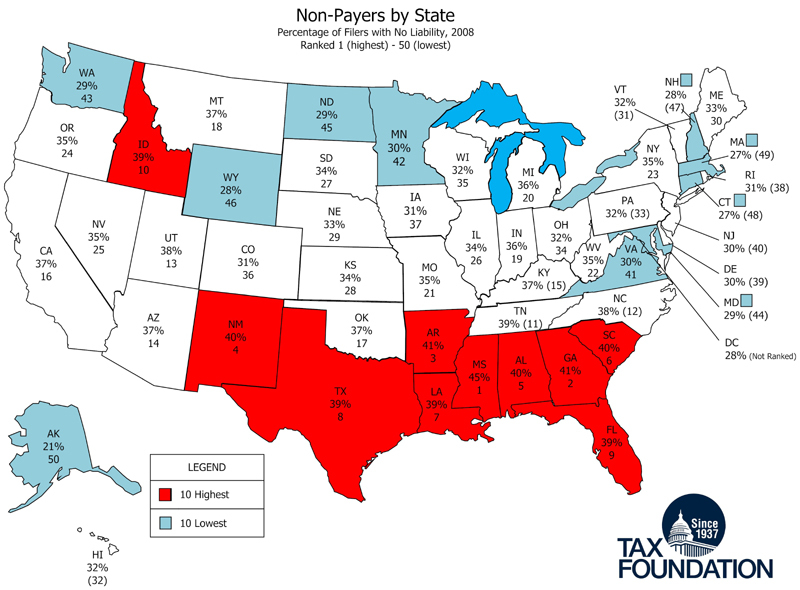 Additionally, a map released by the Tax Foundation illustrates that the states with the highest percentage of non tax filers (those who don’t pay income taxes) are states that typically vote Republican. Romney states that 47% of Americans that do not pay federal income tax are “dependent on the government.” A statement that was partially true; however, his comments do not take into consideration which people in our society compose that 47%. 50% have such a low-income that when personal exemptions and dependents are factored in, no income is left to be taxed. These individuals do still have payroll taxes deducted. 22% are senior citizens receiving benefits including Social Security. They generally have an income of less than $25,000 a year. It should be noted that among those 65 and older, Romney leads Obama by 9 points (52% to 43%). The remaining 12.8% owe no federal taxes due to various tax expenditures like education credits, and reduced rates on capital gains and dividends. The Tax Policy Center estimates that about 7,000 families that fall in this category are individuals who earn at least $1 million a year. The blanket statement that all of the 47% of people “are dependent on federal government” is false. Romney does not take into consideration the individual situations of those who are enrolled in college, senior citizens on Social Security which they paid into all their lives, and even millionaires with tax breaks due to capital gains and dividends. Further examination of his comments proves that at least a portion of the 47% he states it’s not his job to “worry about” are actually Republican voters.